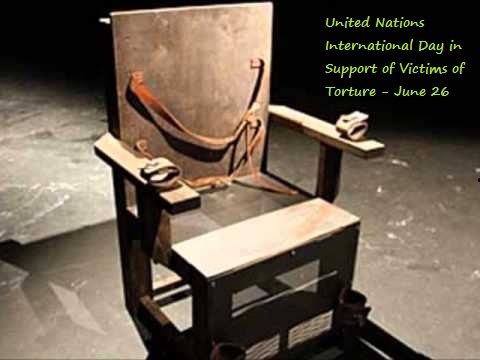 The UN observes International Day in Support of Victims of Torture on June 26 every year to pays respect and support to torture victims allover the world. Torture is cruelest act by human being on their fellow human beings. Despite of there exist international law against torture , the torture happens on all regions of the world. Sometimes it goes beyond all limitations. The mental and physical states of the victims scattered. The torture affects their social state and often they need the rehabilitation by experts. Many of the victims may not reports the incident by their own. UN has decided to come forth with a day to pays respect and educate the society and the victims family. No , United Nations International Day in Support of Victims of Torture is observed as an awareness for torture victims around the globe. How ever Bosnia and Herzegovina opted this day as public holiday. The convention against torture launched on June 30 1987. And also, on 26 June 1945, the UN Charter ( the first international instrument obliging UN members to respect and promote human rights )was signed. The event was originally launched in 1998. What do people do on United Nations International Day in Support of Victims of Torture? Every year International rehabilitation council for Torture Victims monitor the campaign plans for organizations around the world. More than 100 organizations in around 60 countries will celebrate this .